Cut each chicken breast in half and cut crosswise (against the grain) into 10 or 12 strips. Melt the butter in a large heavy frying pan over moderately high heat. Add chicken and sprinkle with salt. 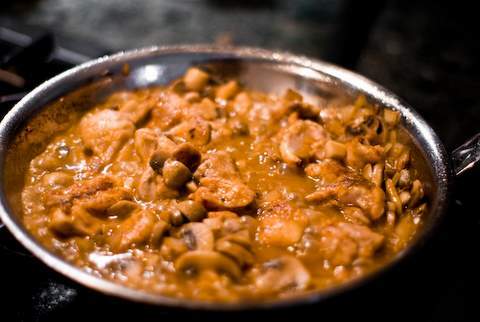 Add the onion, mushrooms and paprika and cook for 2 minutes longer continuing to stir. Reduce the heat to moderate, cover and cook an additional 2 minutes. Meanwhile combine the flour and sherry in a small bowl. Add the mixture to the pan and cook, stirring rapidly until the mixture thickens - about 1 minute. Add the sour cream, and stir unil heated through. Do not let the mixture come to a boil.